Early morning, just past dawn. We were all ready to get down to the village using the rubber boat. Captain Meko with few crews plus the five of us docked to the village and then walked through the pathway that cut through the village, towards the school compound where the Ied prayers would take place. The villager’s compounds lined up on either side of the pathway, some of them in the form of stilt wooden house. The pathway was tidily assembled, part of the village rearrangement project funded by one of the state-owned banks. Children, neatly dressed, waiting for their parents to get ready to go for the Eid prayers, peeking from inside their houses. Others were playing and joking around in front of the houses, while occasionally gazing towards us, a bunch of unfamiliar faces who were passing by their village.. Most of the villagers had gathered in the school yard where the Ied prayers would take place, and we soon joined them, getting prepared to conduct the Eid prayers in congregation. Moments past 6 am, after few announcements and arrangement by the committee, the Eid prayers began. The whole series of agenda run smoothly, and by 7 o’clock in the morning the Eid al-Adha prayers event has been completed. 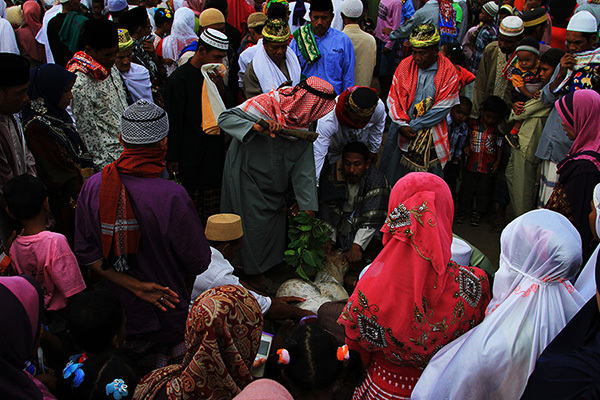 Typically, Eid al-Adha prayers will be followed with the animal sacrificing procession. 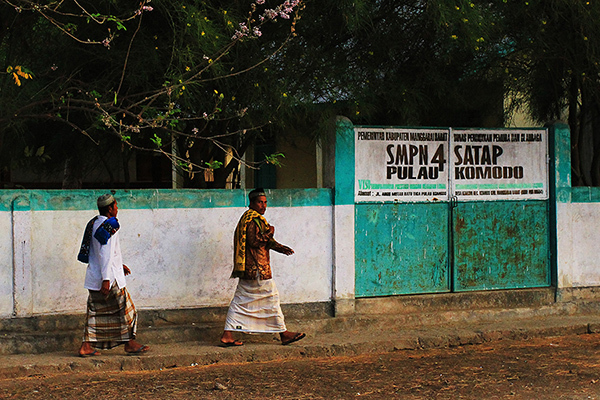 But here in Komodo island there is something else they do first: A mass aqiqah ceremony. Aqiqah is an Islam ritual where parents are advised to sacrifice goats for their newly born children, two for the son and one for the daughter. 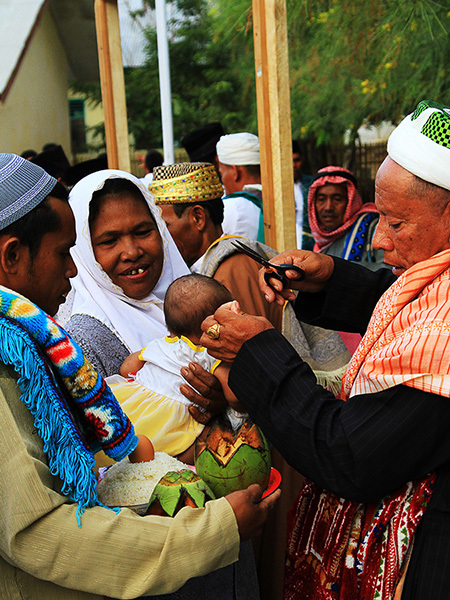 So the Komodo villagers take the Eid al-Adha feast moment to have the mass aqiqah ceremony at the same time, for their children that were born within the period of the previous and the current year’s Eid al-Adha. The parents, with their babies, were lining up in the queue for the clerics and village elders to cut a pinch of the baby’s hair and pray for the babies in their parents drape. After all were completed, they moved to the field in the front of the school yard to lead the slaughter of sacrificial animals. The villagers witnessing the animal sacrificing.. Such sequence of events wouldn’t be found anywhere else, and it was certainly very interesting moment for us. And as always Ihsan, Madon and I were busy walking around with our cameras to capture interesting moments. Chatting with the villagers, taking photos of the kids, and walking around the village for a while. Time flew without us realizing that. Captain Meko and his crew waited patiently. But our other friends couldn’t wait for long. We’d set our goals for the day, there were dive schedule waiting for us. So we immediately rushed back to Tarata to sail further southern part of Komodo waters. Our next destination was Manta Alley..
what’an interesting island. thanks for your story. I know that indonesia has a plenty intetesting places to visit.